Steve Frankfurt: The Link Between Old Spice, 'Mad Men' And An Iconic Photo : The Picture Show Historical photo research points to a man named Steve Frankfurt — the original Don Draper, more or less. 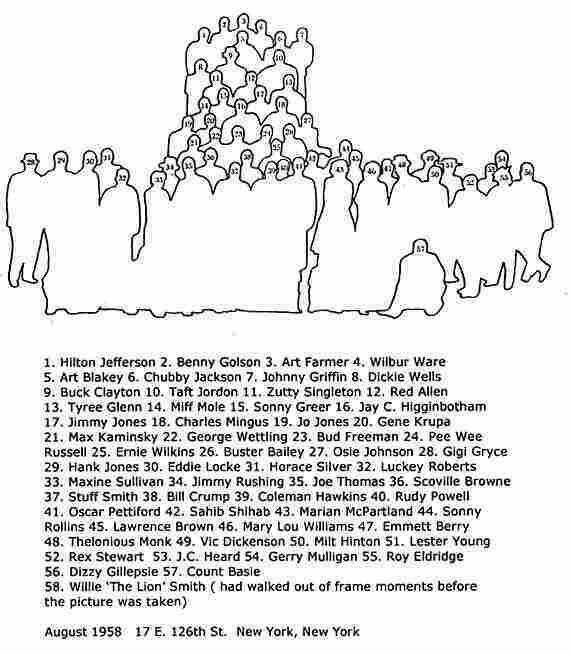 Click to enlarge this key to the photograph. 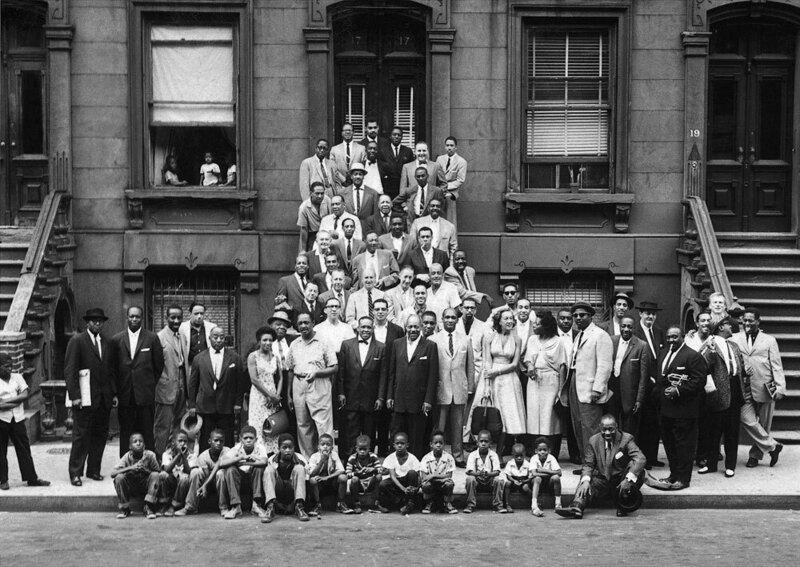 Today on Marian McPartland's Piano Jazz, an octogenarian named Jean Bach discusses A Great Day In Harlem — the iconic 1958 portrait of 57 great jazz musicians. (It's also the title of her Oscar-nominated 1994 documentary about the making of the photo.) It was taken by Art Kane for a special jazz issue of Esquire. But he and the team behind the photo weren't really even photographers. I wanted to know more, so I contacted Art Kane's archives. Although he is no longer living, his daughter-in-law put me in touch with someone else who was there that day. This is where the story swiftly digresses. Because Steve Frankfurt, who was working as Kane's "assistant" that day, is a living story brimming with more stories, most of which have nothing to do with this photograph. When he picked up the phone, Frankfurt was "sitting in a barn of llamas" at his home outside New York City. Dismissing my llama-induced consternation, he insisted that his "poor memory" would be of no help to my photo research. Indeed he may not recall all of the musicians names, and that day's exact course of events may be obscured. But if Frankfurt has any shortage of specific memories from that 1958 morning, he compensates with other personal anecdotes. Like the fact that, although "assisting" Kane that day, he'd never before used a camera. "There I was in Harlem, loading the cameras backward," he recalled with a New York lilt. "If anyone wanted to die, it was me." Neither Kane nor Frankfurt could have called themselves photographers, but somehow they could get away with just about anything. Art Kane was a highly regarded art director for Esquire magazine, and Frankfurt was, well, Don Draper, more or less. The two of them were at the vanguard of a creative revolution taking place on Madison Avenue in New York City. Veritable Renaissance men, both Kane and Frankfurt dabbled in writing, in art, in music, radio, film, acting, composing, etc. They didn't think outside of the box; for them, the box never even existed. Rules were made to be broken, and for Frankfurt, it all came together in advertising. The real "mad men" revolution of the 1960s was not bra-burning or war protestation, but a marketing movement that began in a small office and reached millions of Americans on couches, thumbing through magazines, watching TV or shopping for groceries. If you've seen the Old Spice man, you have been touched by Frankfurt's legacy. 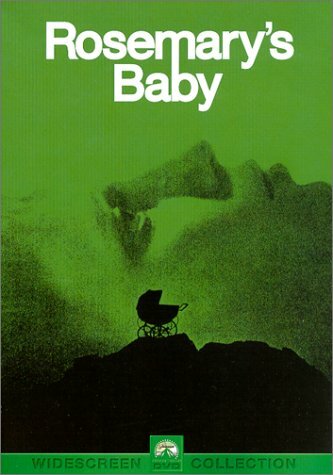 His ad campaign for Rosemary's Baby, for example, was one of the first instances of guerilla marketing in history. The minimalistic poster showed the silhouette of an abandoned baby carriage. And instead of advertising in the arts section of newspapers, Frankfurt simply published one haunting line in the birth announcements section: "Pray for Rosemary's baby." He helped develop Sesame Street; directed the opening sequence for To Kill A Mockingbird; and was also responsible for other one-liners like "In space no one can hear you scream." In his mid-30s, Frankfurt was made president of Young & Rubicam Advertising — the youngest man ever to hold such an office. He was pals with Andy Warhol and Count Basie; he visited Picasso; he actually owns an original Superman costume worn by Christopher Reeve. It's no surprise that his son was asked to create the opening credits for Mad Men. A Great Day In Harlem was one of Art Kane's proudest accomplishments. Same goes for Steve Frankfurt. But, despite the photo's significance, the snap of that camera shutter is a mere blink in Frankfurt's biography. Don't believe a word he says about memory; he could talk for hours. That is, at least, until his llamas call. The stories about Nixon, he teased, are for another time. "We're gettin' off this phone," he joked at the end of our long conversation, "you're drivin' me crazy."